In Challenger 1 Volume 2 Robert Griffin outlines the service career of the Challenger 1 Main Battle Tank and Challenger Repair and Recovery Vehicle. This exciting Photosniper title includes numerous period photographs in colour and in black and white, ten colour plates and vehicle plans for the Challenger 1 Mk. In Challenger 1 Volume 2 Robert Griffin outlines the service career of the Challenger 1 Main Battle Tank and Challenger Repair and Recovery Vehicle. This exciting Photosniper title includes numerous period photographs in colour and in black and white, ten colour plates and vehicle plans for the Challenger 1 Mk.3 as deployed into combat during Operation Granby. The photos selected for this book include original images from the vehicle's trials, its service in BAOR, in Bosnia and in Operation Granby. The Challenger 1 and CRARRV are documented in many unpublished photos and detailed walk around photos include examples taken of the Challengers employed in Operation Granby in 1991 and of the CRARRV in its most recent guise. The highs and lows of the Challenger 1's career in the British Army are described in detail. 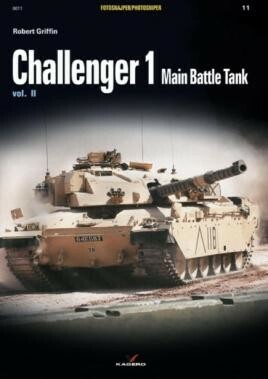 This work is an excellent reference for the modeller, AFV enthusiast and former crewman, and follows Challenger 1 Volume 1, also available from Kagero Publishing's Photosniper series. Many of the photos have not been seen in books before, and they show lots of detail, particularly the extra armour package and the first fitting of the extra fuel drums on the back, when they arrived in the Gulf in 1991... Finish it all off with some scale drawings in both 1/35 and 1/48 scales and some fine colour profiles, this is an excellent companion to the first volume and one that will be a boon to modellers, as well as being of interest to many ex-servicemen who will remember the time they spent working with them.